This writer has been writing for approximately 10 years. I sometimes say “the only thing more crooked than boxing is politics”. For example we see commissions that are not the most honest favoring certain people over others. By messing with managerial contracts favoring the managers and one sided hearings are a pair of examples what happens. One for instance in PA was holding a hearing for a boxer who was not allowed to have anyone but an attorney which he had. The manager came in with a non-attorney and was allowed an unlicensed backer to be allowed to listen in on an intercom. Obviously the boxer lost. The Boxing Director ruled in this case. I believe that same commission head went to a much more violent sport like MMA after that. 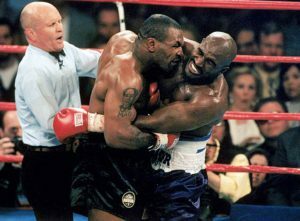 Mills returns and tells the fighters to continue and Tyson proceeds knowing he didn’t get penalized for what he did takes it one step or should I say 10 times further and bites off a piece of Holyfield’s ear knowing he is losing and will not be able to overcome Holyfield for victory. Mills had actually gone to the Tyson corner after the first infraction and they seemed to threaten him if he stopped the fight. Mills wasn’t a referee much longer after that fight. Another example being Nevada who seem to have the most prestigious fights yet when referee Robert Byrd allowed Andre Ward to initiate 46 clinches against Sergey Kovalev and was never deducted “one point” just several warnings. That was in their first fight. All three judges had Ward ahead by a point so if just one point was deducted by Byrd for holding it would have been a draw and Kovalev would have retained his title. I had Kovalev ahead by 5 points based on 8-4 in rounds plus the knockdown. Go to www.youtube.com and see what I mean. Byrd is without question the slowest referee to react of the Nevada referees. Was he being racist in his actions favoring the black fighter over the white fighter? Why Kovalev’s management or promoter allowed a black referee since Kovalev had the 3 titles and Ward none is beyond me. I suggested once to a manager who had the black fighter against a Spanish fighter to get a neutral person such as a white referee. The fight was great and close and the referee made no difference and their fighter won a decision. It’s been my experience when I was a matchmaker for a short period of time a ring physician came over prior to the fight and told the referee who by the way now serves as a commissioner to stop the fight if the one fighter in particular “looks” like he is hurt. I told the ring physician “you can’t tell a referee that in advance”. The fight was stopped in the first round without that fighter being cut or knocked down. The promoter had to have a hearing based on too many stoppages on this promoter’s card. The top promoter who had just as many stoppages as this one was also suspended for 30 days. The commissioner Jimmy Binns, Sr. held that meeting. I was told by the promoter Bob Connelly not to attend. I attended and sat at the table directly across from Binns. When I spoke up and informed Binns that the referee at the table Rudy Battles (now PA Boxing Commissioner) was told by Dr. Davidson to stop the fight if the boxer even looks hurt Binns said “what do you know about boxing?” I replied “maybe you would know something about boxing if you were to come to the weigh-in.” I had my matchmaker’s license revoked for that remark. When Binns was replaced by Harold McCall he came to me during a boxing event and said “come into my office for I want to reinstate your matchmaker’s license”. I never did go in and never did matchmaking again. It is the hardest position of fights for the match-up may look good on paper but you never know how the fight is going to be. Pennsylvania had a good secretary on the commission in Frank Walker. He worked behind the desk not running the shows. Now during Binns time he and Walker’s assistant were sent to work out of Harrisburg some 100 miles away instead of Philadelphia where the commission office was. Both Walker and his assistant suffered health problems and were replaced by Binns. Binns put Greg Sirb in charge as Boxing Secretary and he changed his title to Boxing Director. He runs all the events unless two are on the same night while the three commissioner’s sit there never correcting anything he does. When I let it be known in my report the entire press were told by a promoter you’ll never to sit at ringside again the promoter should have the right to where the press sits and not the Boxing Director. This writer has found infractions on commission members and brought it to the attention of the state without any action being taken or even considered. It’s not what you know but who you know in this business too many times. I will continue to write what I see and not what the promoter or commissioner wants to see. This writer has been banned from press row by two promoters because they “don‘t like what I write”. Guess what? That hasn’t stopped me from writing up their shows as I see them!” When Philadelphia had back to back shows with 14 bouts and 13 ended it knockouts in a bunch of mismatches this writer questioned it causing one of the promoters say “you should write what you see” while the other pulled my press credentials. Recently in VA a rarity happened when Lamont White, 0-7, scored a knockout win over Roger Belch 8-0 at Norfolk on May 13th. Why the commission approved of the fight in the first place is strange but the way it turned out was even stranger.